Is Ensco plc Stock a Buy? 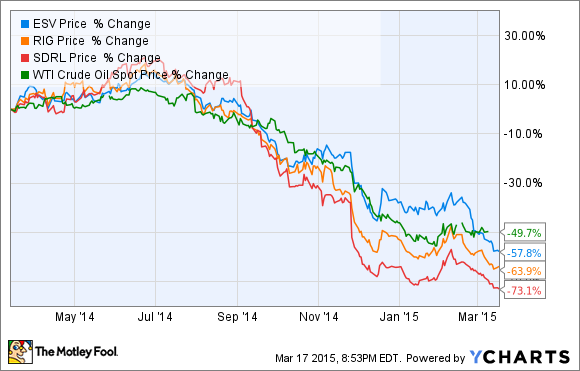 Ensco may be a way to play rising oil prices, but is there a better bet out there? There's no doubt that offshore drilling stocks present an attractive opportunity for investors who see tremendous upside if oil prices recover significantly. It's no coincidence that offshore drilling stocks have fallen in line with the drop in oil, so it seems natural that these same stocks would benefit if the price of oil rises. So, is Ensco (NYSE:ESV) a good bet given the oil market of today? That's what I'll try to answer below. The first thing to consider when looking at any oil-related stock today is whether or not the price of oil will rise in the foreseeable future. Short term, I don't see any sign that oil should rise, because U.S. storage facilities are overflowing with oil, and U.S. production continues to rise. OPEC has also shown no willingness to cut down production because it wants to keep market share, which has been shrinking since the 1980s. Looking out a year or two, the market gets a little more clouded. U.S. drilling has slowed dramatically, which could lead to declining production by the end of 2015, but production isn't likely to drop overnight. Russia, Brazil, and Canada could also curb production because of low prices, but when and by how much is unknown. The demand side is equally tough. Europe and the U.S. have been reducing oil consumption for over a decade, and if China's economy slows, we could see oil production peak and actually begin to drop. With this in mind, it's a crapshoot betting on an oil recovery. One could happen in a few months, or it could take years to crack $50 per barrel again. Fleet ages don't favor Ensco. Source: Seadrill. If you do want to bet on a recovery in oil, the companies that would benefit first are those with the newest offshore fleets. There's not enough demand to meet supply today, but if demand rises, it's easy to see why newer rigs would be more desirable to oil explorers, even if they come with lower dayrates than they used to just to win contracts over older rigs. On that front, I would rather bet on Seadrill (NYSE:SDRL) than either Ensco or Transocean (NYSE:RIG). Seadrill's fleet is very young, and there are few assets that could be cold stacked or retired in the next few years, something Ensco has already started to do with its older rigs. In the high-risk oil business, I'm looking for stocks that have a high ceiling if oil prices recover. In my opinion, Ensco isn't the best offshore drilling stock on that front; I'd rather own shares of Seadrill. 2015 also isn't looking to be a good year for Ensco, not only because revenue and earnings will likely drop significantly. Management has already said it will begin cold-stacking rigs that are coming off contract in order to save costs. That's probably the right move, but when rigs are returned to service, they could require millions in upgrades and upkeep costs just to put back to work. Cold stacking shows the weakness in Ensco's fleet and is the biggest red flag for investors today. I think we have further to go in oil's slide, but when we hit bottom, I'll be doubling down on Seadrill's new fleet instead of Ensco. The risk/reward profile is simply better with a newer fleet of offshore drilling rigs.